Simply One of a Kind: Busy, Busy! 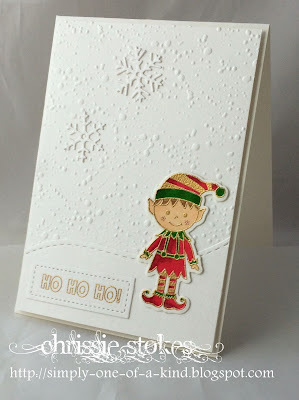 This week has somehow passed me by and I seem to have got little done in my craft room, however here is a little card for a few challenges made with my new Hero Arts Elf set of stamps plus a die for cutting the images out. The sentiment is from LOTV and the snowy EF backdrop from Sheena Douglass. The snowflakes are from All Occasion dies. Super duper CUTE!! Thanks for joining us at CAS-ual Fridays! Okay, this is totally adorable!!! Thanks for playing along with us at the CAS-ual Fridays Challenge! This is so sweet and that background you created is incredible!! Love the colourful elf against that snowy white background, really makes him the star. So very excited to have you join us at CAS-ual Fridays!!! I love all the white on white - and that elf is adorable! I love that little elf and the snowy scene in which you've placed him. Love that EF! Thanks for linking up and playing along with us at AAA Cards. Silly me, just realised that you linked this with us at TIME OUT too, so excited to have you play with us!!!! One Layer time at "Less is More"